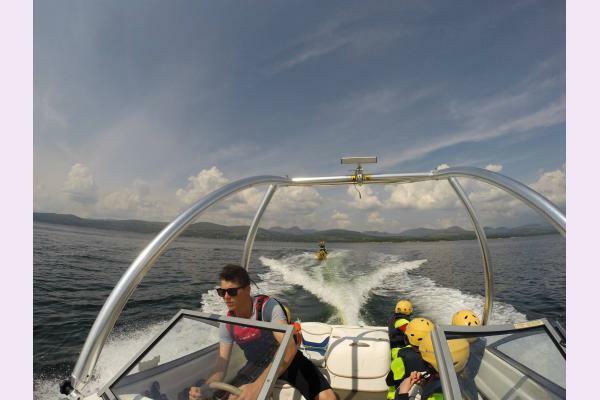 Star Outdoors is an extensive activity centre with water sports, archery and hillwalking which is fun for all the family even in all weather conditions in Kenmare. 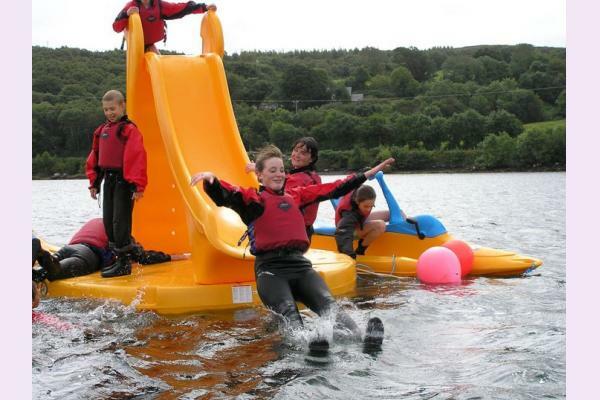 Among its water activities Star Outdoors Kenmare features sailing, boat trips, kayaking, canoeing, pedalboats, doughnut and powerboat rides and a water trampoline and slide. 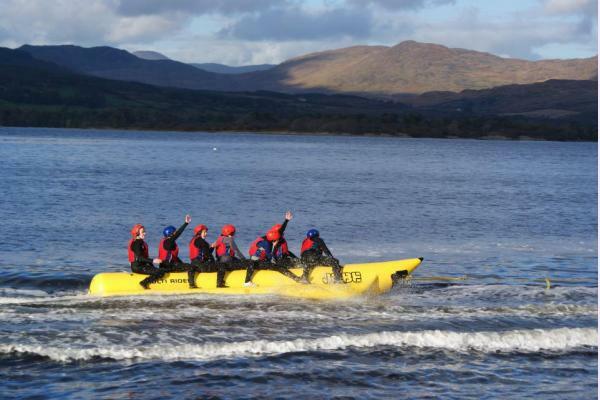 A must for active family fun in Kenmare! It has all modern conveniences which include large changing rooms all with hot showers, wetsuits, booties and buoyancy aids. Professional instructors are always available at Star Outdoors activity centre to help and can be hired to look after you or your group. If you have no experience they will always provide instruction for you to get maximum enjoyment from your visit. Are you looking for something fun to do with the family in Kenmare? At Star Outdoors, we offer specially tailored packages for families, so they can experience new activities together in a safe and fun environment. Our Packages are specially designed to offer good value for money. * Wet suits, buoyancy aids and helmets are provided. * Fully Qualified Instructors that are Garda vetted, First Aid Trained and Child Protection Certified. * Hot Showers/Changing Facilities are onsite. * There is a Playground, Bar and Family Dining onsite. At Star Outdoors, our Adventure Camps offer your children an action packed, and fun filled itinerary that will create memories that will last a lifetime. • Full day €50 per child includes hot lunch. • Full day for additional siblings - €45 includes hot lunch. • Half day €30 per child. • Full 3 days €135 per child. Swimming Togs, Towel and Sun Cream. You are more than welcome to bring your own wet suit but wet suits, buoyancy aids and helmets are provided with all our camps. • When you entrust your child to Star Outdoors, you can be rest assured that they will be fully supervised by our dedicated staff at all times. • All our instructors are qualified, experienced, Garda vetted, Child Protection Certified and best of all, they are all big kids at heart. • We have strict safety procedures as per National Governing Bodies regarding child to instructor ratios (8:1). • Children must be signed in by parents at least 15-20 mins prior to start and signed out at the end of the day. If there is a different person collecting your child, you must make sure to inform your child’s assigned instructor. * Subject to weather conditions and min. numbers required. ** This itinerary is a guideline and depending on conditions is subject to change. Step aboard this memorable voyage with Star Outdoors and explore the beauty of this coastline, the abundant marine life and breath taking scenery. The interior of the boat is decorated to the highest standard with comfortable seating, which is ideally placed on the lower deck offering the best possible vantage points for all your family. Tea, coffee and snacks are available on the inner deck from the bar. 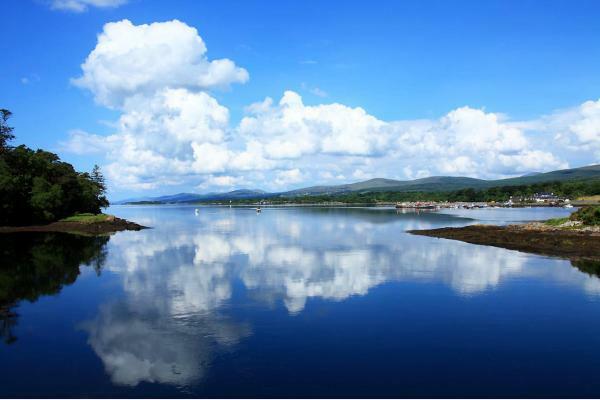 During the boat trip of Kenmare Bay you can walk the outer deck where the scenery, the wildlife, uninhabited Islands, mountain ranges and natural topography can be seen all around you. There will be a guide aboard the boat trip from Star Outdoors and will be able to tell you some interesting facts about the area, pointing out the natural wildlife, give you the history of the Kenmare Bay and will be happy to answer any questions you and your family may have. 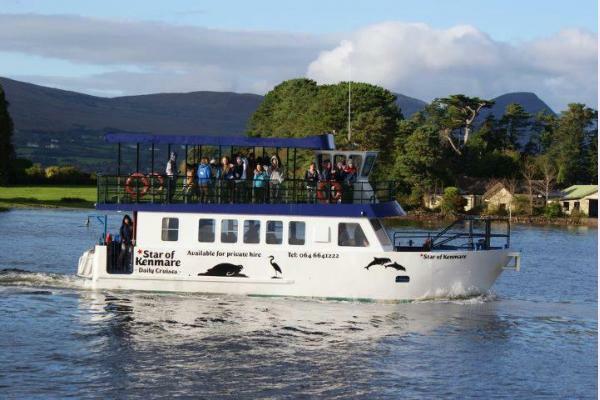 Scheduled sightseeing trips of Kenmare Bay are available on a daily basis from Star Outdoors. They departing morning and evening in high season and once daily, usually mid- afternoon, off peak season. It is aboard a luxury boat with a top viewing deck and full toilet facilities. The Star Outdoors boat trip is ideal for educational fun days out, family fun, birthdays and school trips. 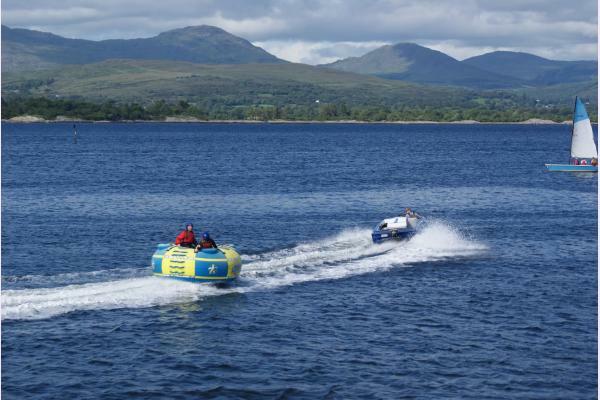 It would be a shame to be in Kenmare Bay and not partake in some of the water activities that Star Outdoors have to offer. These include kayaking, canoeing, pedal boating, water skiing, wake boarding, banana boat and water park. They are all great fun and the water skiing and donut rides are particularly good for those with little or no water sports experience and are perfect for groups. All equipment is supplied by Star Outdoors. We Hire out single kayaks, double and quattro kayaks and Canadian canoes and we are located only a 5 minute drive from Kenmare town. We provide all the gear you need. Our water park is included in the price so you can kayak out to our inflatables, tie up your kayak and have a jump around. Explore the natural beauty and tranquillity of Kenmare Bay with its large seal colony, stunning scenery, wildlife, rugged coastline and sheltered waters. Get up and close to nature with this personal guided tour taking in the beautiful Beara and Iveragh Peninsulas. If you fancy sailing in Kenmare Bay then head down to Star Outdoors and pop on a wetsuit and buoyancy aid as no doubt you will get very wet and probably capsize. All part of the fun! You will be sailing a dingy, which is the most responsive sailing as the vessel is so light you will instantly feel and see the effect of you actions. You will quickly learn the effects of the wind and your actions due to the size of the dingy. If you are confident in your sailing ability and want to step it up from the dingy then why not rent out one of their sailing boats. You and your family can explore all of Kenmare Bay. Enjoy a nice day out with your friends or family safe in the knowledge that professional instructors are always on hand at Star Outdoors Activity Centre to give advice if it is needed. If you would prefer to sail accompanied by an instructor then you can avail of the sailing trips upon modern boats that professional instructors at Star Outdoors offer. With many attractions to see such as seals, dolphins, many different species of birds, and even castles with the wind in your sails there is countless options and destinations. All you and your family need do is sit down and relax as you enjoy the view and the feeling of the wind in your hair as you sail through Kenmare Bay. These trips range from one hour in duration to up to six hours if you want a chance to spot the seals. Star Outdoors also offer a full days sailing with a packed lunch on board to drop anchor and have lunch either in the middle of the bay itself or on the many piers and islands. If you don’t feel up to trekking across the hills or diving into the water activities then why not try your hand at archery? Star Outdoors have an extensive archery range and even provide left-handed and right-handed bows for your utmost convenience. This is an ideal activity to take part in as part of a group. This is a fantastic activity for all ages once they can hold a bow. We have junior bows to enable smaller children to participate. There is no previous experience required. It is fun, safe and easy to learn. This is a supervised activity thought by our fully qualified instructors. It does not require any unusual levels of fitness. A steady hand and a clear head goes a long way. All you need to bring is a sense of adventure. We have an all-weather shooting range so there is no rain interruption making it ideal no matter what the conditions. Can I combine archery with other activities? Archery can also be done as part of a package such as the family package, couples package, hen and stag packages and corporate days out. 50 Euros for the first 3 people and 10 Euros for every extra person. The Archery session lasts an hour. Start off by hopping through our tyre run, crawl through a tunnel, climb over a small wall, Crawl under a net, Climb over a rope wall and do a set of monkey bars, balance over beams and swing across a pool of water. Three people can go at one time and race each other and this can also be done in a relay fashion. The age requirement is 8 years and over due to heights of obstacles and abilities required. Safety Helmets are provided and this activity is supervised by our instructors. A change of old clothes and runners. Can I combine the obstacle course with other activities? Yes, the obstacle course works well along with archery, paintball, splatball, team games and murder mystery. The obstacle course is charged by the hour. Many use up the hour well using different tactics to overcome the different obstacles. Others are happy with one or two runs. If you finish up early (half hour), we will throw in a complimentary game of mini golf. 13 Euros per adult, 10 Euros per child. Splatball is the newest and most exciting children's adventure experience taking Ireland by storm. It is specifically tailored for young kids as low impact guns are used. Great for kid's birthdays, schools, families, hen parties, team building and youth groups. 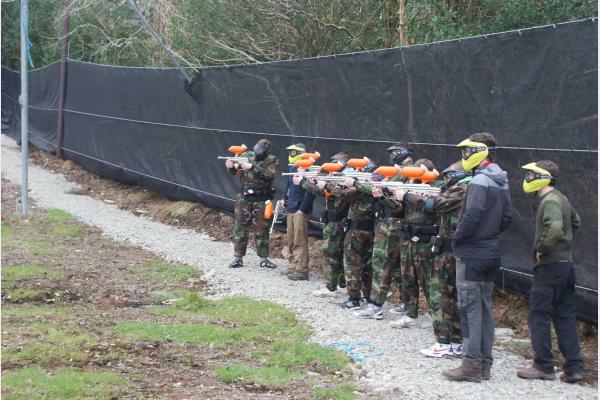 It takes place at our onsite paintball course and we have the perfect sheltered natural woods for this activity. Children are provided with all safety gear and goggles and are given a safety briefing before they begin. It takes place in a safe playing environment and is ran by qualified and friendly instructors that are garda vetted. Safety is always our primary concern. What time can we play? Two hour sessions will run throughout July and August. Pre-booked groups can pick a choose most suitable time for them. Opened from March until end of October. Yes, there is are restaurant onsite with views of Kenmare Bay where parents/guardians can relax with tea/coffee while our instructors look after your group. Food can be added to package for €5 per person. ** Young adults under age of 18 must have a signed consent form. Crazy-golf in Kenmare. 18 holes of crazy golf with fabulous views over Kenmare Bay. Located on the Wild Atlantic Way this crazy-golf course probably has the best views in Ireland looking out over Dinish Island, the Kenmare Bay and Carauntohill in the background. Comprising of 18 holes well set out over two levels using all weather surface for each hole allows this course to be played in all types of weather. Crazy-golf suitable for all ages and abilities. It is suitable for all ages and abilities. We have three different sizes of clubs available to hire, even junior ones made from plastic that will not hit too hard. We provide low bounce balls also that are more child friendly and in different colours that is very important especially for children and the more competitive. It is common to see grandparents playing with their grandchildren. The course is also securely closed in so works well for younger children. You enjoy lunch on the balcony while overlooking the kids below enjoy a game of mini golf and play ground. Crazy-golf for fun or competition. Score cards available for the competitively inclined. It simply requires you to pop into our offices where we will provide you with a club and scorecard and off you go. After all Rory Mcllroy had to start somewhere! Star Outdoors can cater for school or group trips from the ages of twelve upwards. They range in aims from team building programmes to Gaisce programmes (the President’s Award) to outdoor survival experience, which is aimed at Transition Year students or older. Star Outdoors are happy to arrange educational programmes for your school or group and to suit your individual needs through sailing courses, kayaking or canoeing courses etc. To suit every age you can avail of the Multi-Activity trip which includes a host of activities from sailing to archery to hillwalking and raft building and even water trampolining. Guaranteed to be full of fun for all the family. Summer Camps successfully run every year at Star Outdoors and are ideal for adventure loving children. Star Outdoors Adventure centre is located just 5 minutes from Kenmare town on the R571, Ring of Beara road. It is set on the southern shore of the Kenmare Bay and surrounded by the Caha Mountains. An ideal safe place to sail, kayak and explore the mountains.